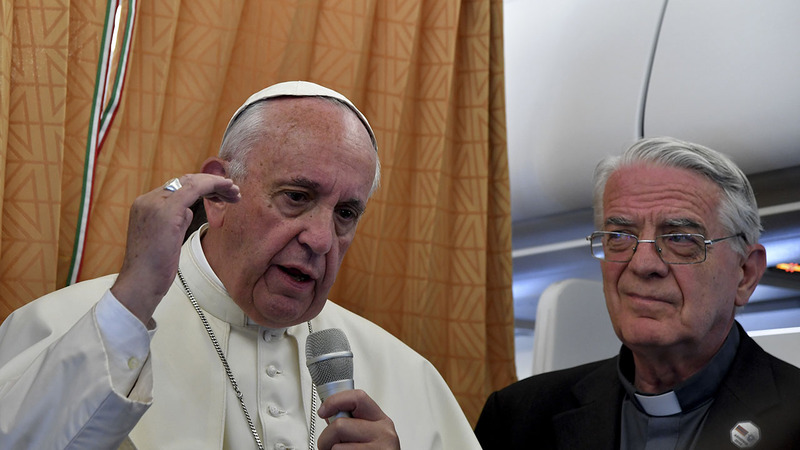 ABOARD THE PAPAL PLANE -- Pope Francis on Sunday said he won't label Islam as "terrorist" because that would be unfair and not true. Reporters aboard the papal plane flying him home after a pilgrimage to Poland that began the day after extremists slit the throat of an elderly priest celebrating Mass in a French church, asked him why he never uses the world "Islam" to describe terrorism or other violence. While in Poland, Francis made an unscheduled stop at a church in Krakow to implore God to protect people from the "devastating wave" of terrorism in many part of the world. Francis replied that "it's not right to identify Islam with violence. It's not right and it's not true." He added: "I believe that in every religion there is always a little fundamentalist group." "I don't like to talk of Islamic violence because every day, when I go through the newspapers, I see violence, this man who girls his girlfriend, another who kills his mother-in-law," Francis said, in apparent reference to crime news in the predominantly Catholic country of Italy. "And these are baptized Catholics. If I speak of Islamic violence, then I have to speak of Catholic violence." Noting he has spoken with imams, he concluded: "I know how they think, they are looking for peace." As for the Islamic State group, he said it "presents itself with a violent identity card, but that's not Islam."